From the Start screen, tap the Mail app’s tile and then tap the New icon in the program’s top-right corner. An empty New Message window appears, ready for you to fill with your words of glory. If you’ve set up several e-mail accounts in the Mail app, your e-mail will be sent from the account you last viewed. To send e-mail from a different e-mail account, delete that message by tapping the Delete icon (shaped like a trash can) in the screen’s upper-right corner. Then switch to your desired account by tapping its name from the program’s bottommost left corner. When your preferred account appears, tap the New icon to send an e-mail from that account instead. Add your friend’s e-mail address into the To box. Tap the word To next to the To box. The People app appears, letting you tap the name of everybody you want to receive the e-mail. Tap the Add button, and the Mail app automatically fills in everybody’s e-mail address — a very handy thing on a tablet. Or, you can tap inside the To box and type the recipient’s name or e-mail address. With each letter you type, the Mail app scans the contacts listed in your People app, constantly placing potential matches below the To box. If the app happens to guess the right name, tap the name to place it in the To box. 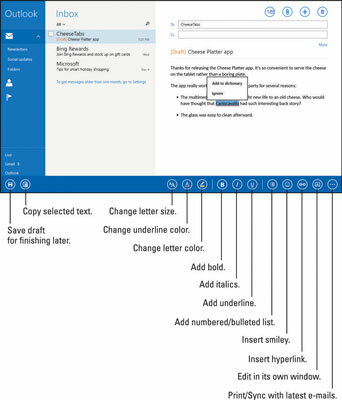 Tap inside the Subject box and type in a subject. Tap the words Add a Subject along the message’s top; those words quickly vanish, letting you type your own subject. Type your message into the large box beneath the Subject line. To embellish your prose, change the text’s formatting by swiping your finger upward from the screen’s bottom to fetch the App bar. The App bar lets you change fonts, add italics, create numbered lists, and add other flourishes by tapping the appropriate icon. Attach any files or photos to your e-mail, if desired. Here’s the gist: Tap the Attachments icon on the Mail app’s App bar. The File Picker appears, letting you navigate to your file’s location, tap the file’s name, and tap the Attach button. Tap the Send button, located in the screen’s top-right corner. The Mail app slides your e-mail through the Internet’s blend of fiber-optics, radio waves, and copper wires into your friend’s mailbox. Depending on the speed of your Internet connection, mail can arrive anywhere from within a few seconds to a few hours, with a minute or two being the average. If you find yourself at a loss for words, slide your finger up from the screen’s bottom edge and then tap the Save Draft button. The Mail app stashes your unfinished e-mail into your current account’s Drafts folder for later polishing.